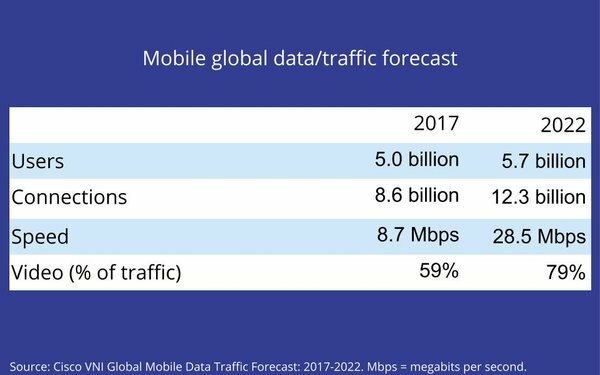 Mobile traffic will approach an annual run rate of a zettabyte by the end of 2022, according to a new forecast on global mobile data traffic and speed released today by Cisco. A zettabyte equals 1 trillion gigabytes. The report projects mobile traffic will account for 20% of all global IP traffic by that data, up from just 5% ten years ago. Most importantly, mobile speeds are projected to increase dramatically, and with them, consumption of video content. By 2022, 79% of mobile traffic will be attributable to video, vs. 59% in 2017.